Such is the craziness of CES … at 6 p.m., I was listening to Peter Frampton at the NBCU party in the Gibson tent; now, I’m at The Venetian for the CEA Leaders in Technology dinner. During the reception, I did an impromptu interview with FCC Commissioner Michael Copps, who was pleasantly surprised by FCC Chairman Kevin Martin’s comments today that he has asked for an investigation into net neutrality. This annual dinner, as CEA’s Gary Shapiro just reminded us, is the largest gathering of technology leaders and policy makers. 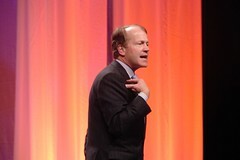 Cisco (NSDQ: CSCO) CEO John Chambers is tonight’s keynote. He’s a rover, stepping off the stage and walking through the room. The group. (Now he’s behind me.) Chambers has spoken at various CES events so many times since 1999, he’s using the record from those projections about the internet’s impact as a foundation. Chambers, not surprisingly, says the next phase will be about the network on every level and every portion of his rapid-fire speech is meant to back that up. — “Time magazine got it backwards (last year with You as person of the year). It shouldn’t have been you .. it should have been our. The future is really about us.